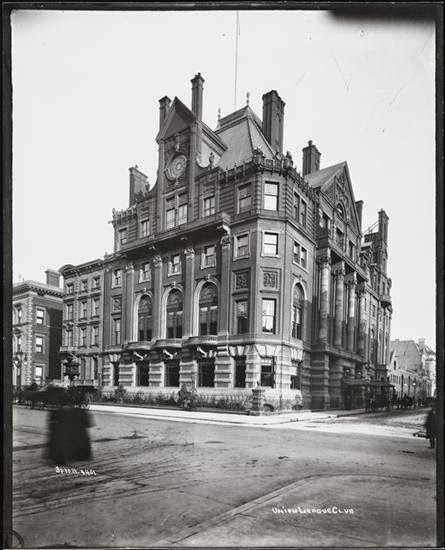 In 1876, only a few blocks north of the Astor mansions, Dickel’s Riding Academy sat at the northeast corner of Fifth Avenue and 39th Street. When James Gordon Bennett, Jr. returned from England that year he brought back a newly-found love for polo. Bennett soon organized indoor polo games in the Academy. But the riding academy would not last many years longer. Over a decade earlier the Union Club was the most exclusive men’s club in Manhattan, if not the nation. But trouble arose over a single member, Judah P. Benjamin. The newspaper said “This act of friendship for a rebel in arms produced great indignation, and the contributors to the Benjamin dues fund were severely and unsparingly criticised.” As a matter of fact, the heated differences between the pro- and anti-Benjamin factions were such that repeated threats of duels arose—although none came to pass. The great irony, of course, was the name of the club itself—The Union. The rift was resolved when 70 members resigned and formed a new club, The Union League Club. “The only requisite for membership, besides unblemished reputation, should be an uncompromising and unconditional loyalty to Nation and a complete subordination thereto of all other political ideas,” said the New-York Tribune. Perhaps to make its disdain of the Union Club clear, within 15 days of its organization on February 6 1863 the Union League Club raised a regiment of black troops. 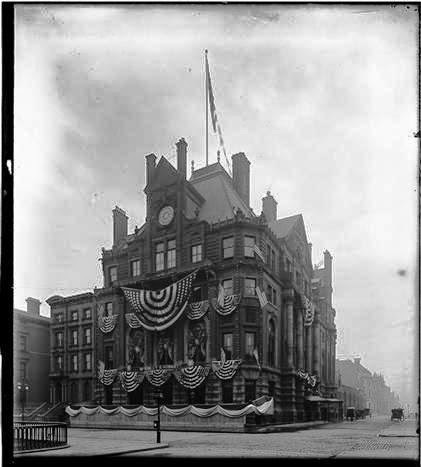 “After the presentation of the colors the troops started for the wharf where they were to embark for Florida, and 350 members of the Union League marched at the head of the column,” reported the Tribune. The club’s ardent patriotism would remain a vital element throughout the decades. Starting out in rented rooms, it moved to the former Leonard Jerome mansion on Madison Square in 1868. Within a decade the club was looking for a new headquarters. It would be the end of the line for Dickel’s Riding Academy. 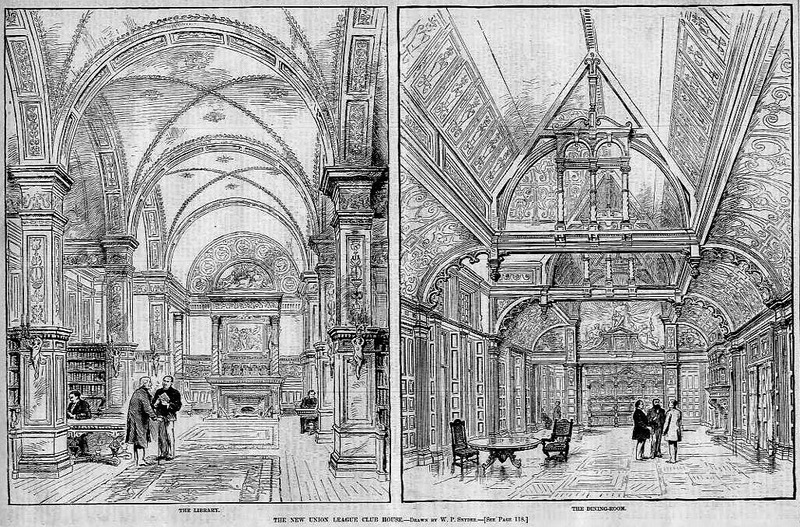 In 1879 the Union League Club held a competition for the design of a clubhouse appropriate for one of the wealthiest and most exclusive clubs in the city. The commission went to Peabody & Stearns. By February 1881 the building that replaced the old riding academy was nearly completed and no detail had been overlooked. On February 3 the Gorham Manufacturing Company announced that the silver service for the club was on exhibition in its rooms. A day later the New-York Tribune commented on it. The expected date for the clubhouse opening was February 22; but a day after that the New-York Tribune noted that work was not yet completed. Although the construction was done, “the building is overrun with joiners, finishers and varnishers, who are putting on the last touches. The furnishers and upholsterers are already in the building, and a large part of the furniture of the club has been placed in the rooms. Yesterday the heavy curtains were being hung in the library. The shelves were ready for the books, and much of the furniture was in the room. The billiard tables were in the billiard room, but were unpacked.” Most of the rooms were in the same condition—just needing unpacking and decorating. “The stained glass has not yet been placed in the sashes of the window at the head of the first landing of the main stairway, but it is in readiness.” The newspaper now said that “unless something unforeseen happens,” the clubhouse would be ready in a few days. The newspaper commented on the interior spaces, designed by Louis Tiffany, John LaFarge and Franklin Smith. “The interior presented a gorgeous spectacle in the evening. All the lights were burning. The library, billiard hall and numerous reading and sitting-rooms were much admired and closely inspected.” On the walls hung about 100 portraits of “men of eminence” painted by well-known artists. The art collection included bronze and marble busts and statues, engravings and oil paintings. Peabody & Stearns had created a $400,000 hulking pile of brick and brownstone born of the unexpected marriage of Italian Renaissance and Queen Anne. Variously shaped gables and chimneys poked through the high hipped roof, while balconies, pilasters, columns and carved panels created a visual overload. A turn-of-the-century postcard provides a glimpse at the contrast in materials. 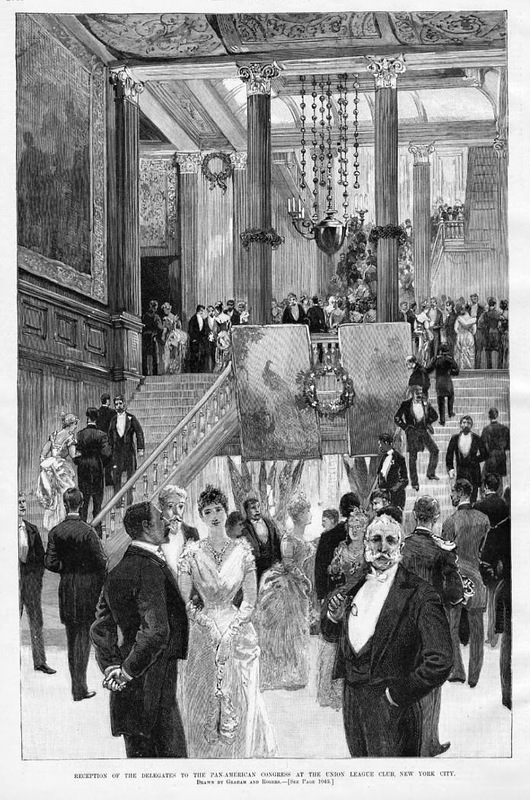 Not forgetting its roots, on April 17, 1890 the Union League Club gave a glittering reception for General William Tecumseh Sherman. The Union general had just turned 70 years old. The importance of the event was evidenced by some of the guests: Secretary of the Interior John W. Nobel, Vice President Levi P. Morton, senators, generals and foreign diplomats from Russia, Chili, Brazil and Peru. The Sherman reception was but one of many held for men of importance. On February 10, 1913 The Sun said “Its receptions and banquets have been famous for half a century, and among its guests of honor have been some of the most prominent men in the history of their day. Beginning with the name of Abraham Lincoln, the list embraces hundreds.” The newspaper listed names like General U. S. Grant, Major-General Philip H. Sheridan, Edward M. Stanton, Rutherford B. Hayes, James G. Blaine, Benjamin Harrison, William McKinley, Theodore Roosevelt, William H. Taft, Prince Henry of Prussia and many others. On June 21, 1900 Governor Theodore Roosevelt arrived in New York City from Philadelphia where his name was presented as running mate for William McKinley. Reporters thronged around him as he stepped off the train. No reporters would get through the Union League Club doors to accost the esteemed politician. 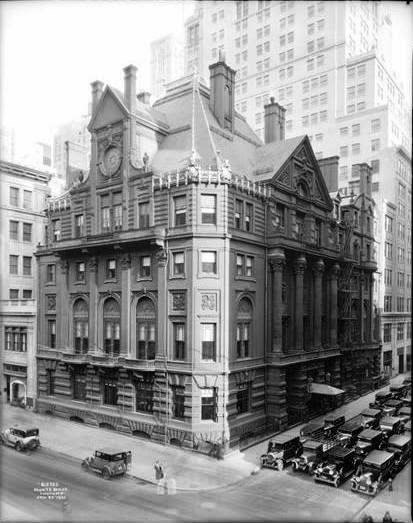 A decade later, as the Great Depression cast a pall over the country, the Fifth Avenue neighborhood around the Union League Club had been engulfed by business buildings. On August 28, 1929 the club announced its plans to erect a $1 million clubhouse on Park Avenue at 37th Street. 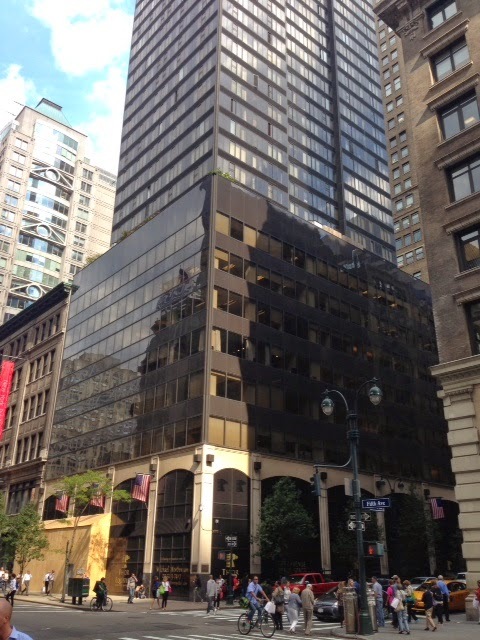 Plans were filed soon after for the erection of a 47-story office building on the site. The grand clubhouse sat empty and silent for a year—until 1:00 in the morning on January 26, 1932. Somehow a fire started in the basement. Within an hour and a half “the entire structure was a raging furnace that seemingly defied the efforts of a small army of firemen to put it out,” reported The Times. By morning the Union League Clubhouse was a gutted shell. On its site today stands a soaring black glass office tower. That the monumental and quirky clubhouse stood here for half a century is generally forgotten. It was an odd building. Looks like parts and sections from several structures were assembled in to one, but you have to admire the brick work in those many chimneys.